The world was shocked this week after a horrific video surfaced showing a US-backed rebel group in Syria beheading a 12-year-old Palestinian boy, in yet another example of how the Syrian rebels are the complete antithesis of moderate. Psychopathic members of the Nour al-Din al-Zenki group – which was formed in late 2011 and operates around the city of Aleppo – carried out the atrocity. In a ridiculous statement, the leaders of the al-Zenki group called the atrocity a “mistake” – how anyone can characterize hacking a child’s head off with a knife a “mistake” is beyond me. The rebel group accused the boy of being a member of the Liwa al-Quds (Jerusalem brigade), an armed Palestinian group that supports the Syrian government. Liwa al-Quds released a statement stating that the boy was not a fighter however, and was merely an innocent, ill child called Abdullah Issa, who lived in an impoverished area, according to an Al Jazeerareport. Al-Zenki has received military aid and TOW missiles from the US, a fact that even Reuters admitted in an October 2015 article. Earlier this month, Amnesty International released a report which detailed how the al-Zenki group was involved in abducting and torturing various individuals, including humanitarian aid workers. This rebel group is just one of the numerous legions in Syria who have received arms and financing by various countries who have been supporting the ‘moderate’ Syrian opposition, with the US being one of the largest proponents of this strategy. As many critics of this policy have been warning, flooding Syria with arms and mainly foreign terrorists was only going to lead to atrocities of this nature. This latest abhorrent act is certainly not the first committed by rebel fighters either; a video which surfaced in 2013 showed a rebel biting into the heart of a dead Syrian soldier. Unknowingly supporting extremists is one thing; but deliberately empowering terrorists is a completely other situation. The US has been fully aware of the nefarious nature of the forces fighting against Bashar al-Assad for years. Despite this warning, the US and their allies intensified their support for the opposition. 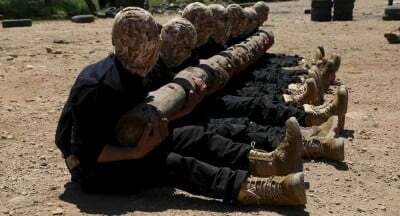 A December 2012 article by Business Insider reported that the US was sending heavy weapons – including anti-tank missiles, rocket propelled grenades and anti-aircraft heat-seeking SA-7 missiles – from Libya to the Syrian rebels. A 2013 article by the Washington Post details how the CIA and State Department were sending weapons, munitions, vehicles, communications equipment and medical kits to the rebels. Of course, the US was playing a critical role in arming the rebels before late 2012. A June 2012 article by the New York Times titled: C.I.A. Said to Aid in Steering Arms to Syrian Opposition, reported that CIA agents were in southern Turkey helping to funnel arms to the rebels. Also this week, US and French airstrikes killed over 140 civilians near the Syrian-Turkish border. The Syrian Foreign Ministry sent letters to the United Nations (UN), demanding that the international body takes action. The US-led coalition is operating illegally in Syria – unlike the previous legal Russian campaign – as the Syrian government has never authorized the US-led bombing campaign. Hopefully the beheading of an innocent child will spark a real commitment by the US to seriously defeat the terrorists in Syria, by working alongside the Syrian Army, Russia, Iran, and other important players in the region.